Some recipes manage to surprise me. Pollo al diavolo is a fairly common recipe for Italian (and Italian-American) cookbooks. Usually, it’s just a spicy chicken that’s either sautéed or braised. It’s rarely bad but it’s become normal and expected. This recipe was not at all what I was expecting. To be honest, I was sold on this recipe merely because the picture of it looked good (unfortunately, I don’t think my pictures turned out as well). I saw the name and recognizing that it implied spicy food, I figured it’d make a good dinner. Except, this was significantly different than any version of Pollo al diavolo I had ever had. Most are spicy through red pepper flakes; this is spicy through the black pepper it’s cooked with as well as a spicy oil (olio picante) that you can optionally drizzle over top (I chose to, Angela didn’t). Despite the relatively short period of time that the black pepper mixture is on the chicken, the pepper taste is absorbed by the chicken. Unlike my experiences with steak au poivre (which I would happily accept as mistakes in my cooking), the pepper did not overpower the taste of the chicken but merely complemented it. I found that the olio picante also complemented the chicken but it tastes primarily of jalapeños with a surprisingly muted heat. The brining of the chicken is my addition to this recipe (it wasn’t in the original). It did help to make the chicken nice and juicy. If I were to make it again (and I probably will so this can be considered a note to myself), I’d probably add crushed black pepper corns to the brine. I enjoyed the parsley salad although the parsley portion of it was my least favorite. I’d be happy to substitute a different leafy green for the parsley and I can’t imagine it wouldn’t improve the outcome. The vinaigrette nicely contrasts with the spiciness of the chicken. As I said, my overall impression of this was surprise. It was less spicy than I expected and the spice was completely different. It’s a much more elegant version of a normally pedestrian dish. In a sauce pan over high heat, combine all the brine ingredients. Bring to a simmer, stirring until the salt and sugar are dissolved. Remove from heat and allow to cool to room temperature. Put the brine in the refrigerator and allow to chill. Add the chicken and brine for 8 to 12 hours. Remove the chicken from the brine, rinse, and pat dry with paper towels. Allow the chicken to rest in the refrigerator for at least 8 hours. Truss the chicken and baste it all over with the olive oil. Place in a roasting pan and roast in the oven for 40 minutes. Combine the 1/4 cup black pepper, a pinch of salt, and the mustard and whisk together. Drizzle in 1 tbsp of olive oil, whisking until blended. 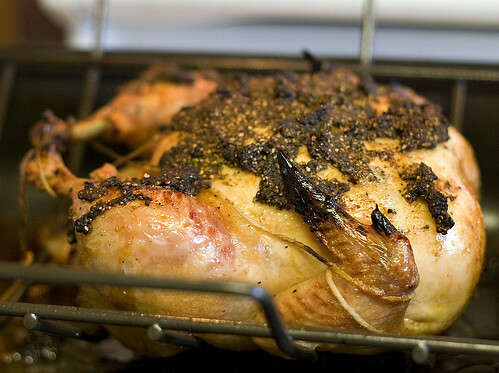 Remove the chicken from the oven and brush the chicken with the pepper-mustard mixture all over. Return the chicken to the oven for another 30 minutes. Remove the chicken from the oven and allow to rest for 10 minutes. 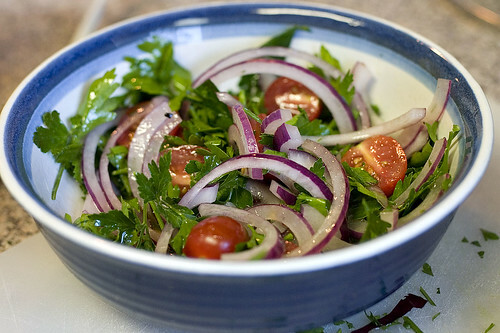 Meanwhile, combine the parsley, onion, tomatoes, vinegar, 3 tbsp olive oil, salt and pepper in a bowl and toss well. 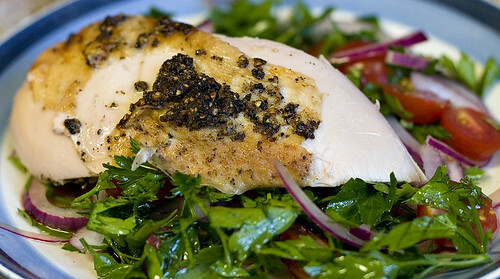 Carve the chicken and serve it with the parsley salad and drizzle it with the olio picante. In a saucepan, combine all the ingredients and heat until the oil reaches 175ºF. Remove from the heat and allow to stand overnight. Strain the solids out of the oil. The oil will keep for up to 3 weeks in a cool, dark place. Makes 1 cup of oil.